The bountiful islands of Greece feel like a breath of fresh air in so many ways. Life by these seas is slow-paced and indulgent, simple but breathtakingly beautiful. 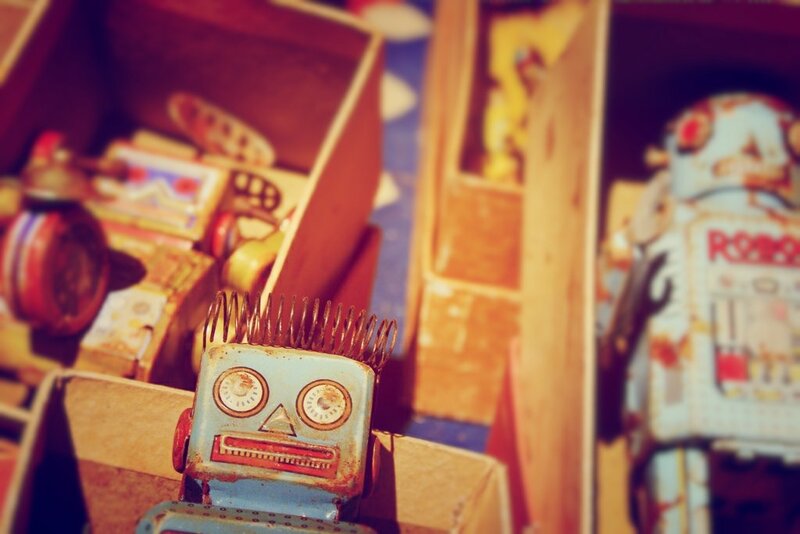 Time seems to have slowed down here, and when things at home get hectic, that’s often just the thing we need. Nothing brings a family closer together or creates longer-lasting memories than spending a week or two just living in the moment. One of the best things about Greece is that there are so many islands to visit (227, in fact) and that each one brings something unique to the table. You can’t go wrong choosing any of the islands for a holiday, but doing a bit of research beforehand never hurt anyone – especially when you’re bringing the kids along. 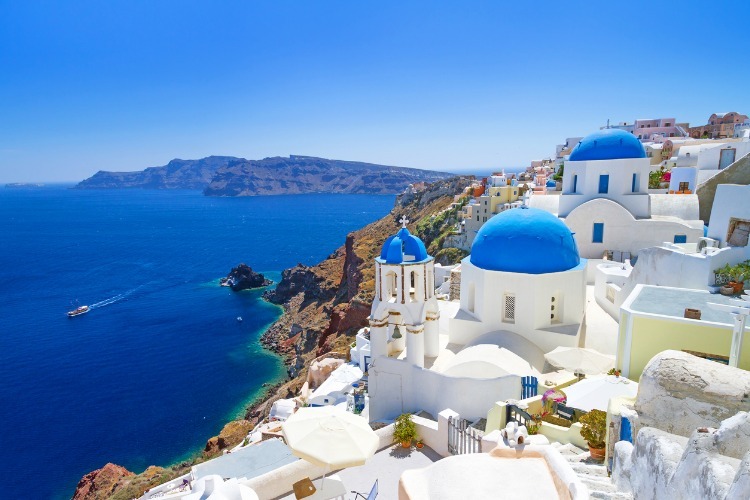 To help you decide which of the Greek islands is best for your family, and to kickstart a bit of wanderlust, we’ve put together this simple guide. Enjoy reading, and find your favourites on the map at the end. Spectacular Corfu is an island of lush greenery, dramatic hills and quaint little villages where beautiful and varied beaches abound. In the west, you’ll find Glyfada and Saint Gordios with their stretches of soft sand and the pebbly playground of Paleokastritsa. Meanwhile, the island’s north side offers warm shallow waters for swimming and stunning rock formations on beaches like Sidari. From sandcastles to water sports, beaches are always a hit with the kids. 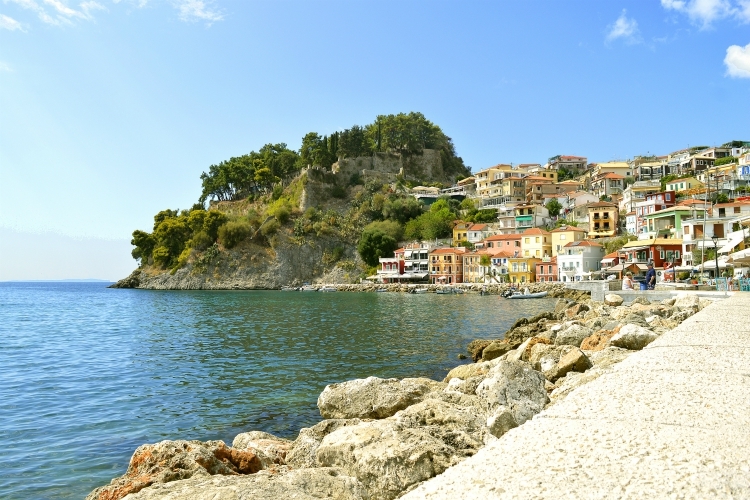 The UNESCO-ranked Corfu Town is where kids tend to love running through the mazes of traditional kantounias, winding alleyways that encircle the city’s distinctly Venetian architecture. It’s the perfect place to introduce the kids to some local cuisine and scope out a restaurant serving pastitsada (best enjoyed with some local ginger beer). Corfu may be popular with the tourists but don’t be afraid to head off the beaten track as Corfu hides some incredible hidden gems within its olive groves and rural villages. Like the Spanish, most Greek islands have a legally mandated mikró ýpno between 3 and 5 pm where everything and everyone stops moving. Mikró ýpono is the perfect time to spend enjoying a cold drink and some snacks by the pool of your villa before heading out on some evening adventures. The Greeks call Crete Megalónisos – The Great Island – and it’s well worth a visit to find out why. Crete’s sunny beaches and sparkling coves mingle with ancient caves and ruins that could make anyone’s fantasy run wild. This is where you’ll find the heart of Europe’s oldest civilisation, Knossos, and its spectacular palace ruins. Thanks to the efforts of modern archaeology, visiting Knossos in the twenty-first century is like walking the kids through a history lesson come to life. And for even more learning about the history and culture of Crete, head to the capital city of Heraklion, sometimes known as Iraklio City, and explore the interactive kid-friendly museums there. We’re particularly big fans of the CretAquarium and the Natural History Museum. For a beach day (or two, or three), Chania on the west side of the island is the place to go. The white sandy beaches here feel like they’re on a desert island but are just a stone’s throw from the city’s gorgeous Venetian harbour and waterfront restaurants where the kids can have a taste of freshly caught calamari. Kids will particularly love the lagoons of Elafonisi and playing in the rock-pools at Kato Gouves. Sea kayaking, scuba diving and windsurfing are just the tip of the iceberg when it comes to water-based excursions in Crete – make the most of it! Dikteon Cave is another fascinating excursion to take with youngsters who will be as fascinated by the Greek legends associated with its depths as by the mysterious rock formations that are revealed inside. For further outdoor adventures, find your way to the Samarian Gorge; the perfect day-long hiking excursion in Europe’s longest canyon. It’s perhaps best suited to older kids who enjoy a bit of physical activity, but certainly a sight to see. The gorgeous island of Rhodes has much to look forward to, not the least of which its magical east coast covered in beaches. For thirty miles, all you’ll see is soft golden sands and warm shallow waters. If you came to Greece looking for rest and relaxation, you’ve found it. Faliraki beach is one of its most family-friendly stretches, with plenty of recreation for kids like the Faliraki Water Park and a Luna Park. But if you’re after something more slow-paced and quieter, try Agathi and Kallithea Springs as well. A bonus is that Rhodes has the longest-lasting summer of all the Greek islands, so if you’re lucky enough to get away in the off-season you can enjoy these places when the biggest crowds haven’t arrived yet. Rhodes Town is a UNESCO World Heritage-listed haven of car-free cobbled streets and medieval fortresses which feels like taking a walk through history. You can even wander along the walls of the old town and take in all the great views from up high. At sunset, head to the harbour and watch the fishermen reel in their catch of the day (then head to one of the local restaurants for a fresh taste). Kids will also love getting up close to the underwater world of the eastern Med at the Marline Aquarium. Find it in a medieval building right on the town’s beachfront, designed to give the feeling of being underwater yourself, surrounded by corals, octopuses, turtles, fish and much more. Rhodes’ inland is covered in thick green forests and mountains. Don’t miss out on an excursion to Petaloúdes (Butterfly Valley), a peaceful and lush nature reserve where you can roam the trails surrounded by butterflies everywhere you look. 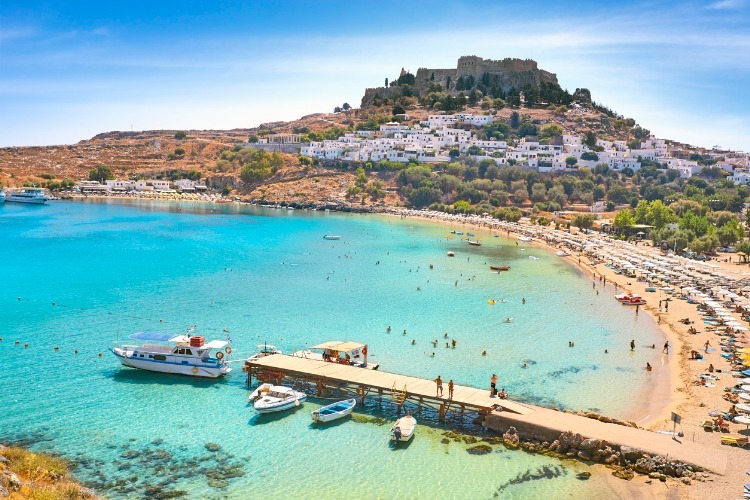 For an introduction to the fascinating history of Rhodes, take a trip to the archaeological site of Lindos and marvel at the impressive Acropolis. If the whole family is up for a bit of an uphill climb, the views from its hill are breath-taking, and you can admire this 300 BC building up close. Once in Lindos, make a detour to the turquoise waters of St. Pauls Bay where you’ll find the most spectacular backdrop for your family photos. Mykonos has so much more to offer than its reputation as a party-hotspot gives it credit for. The Island of the Winds is one of Greece’s most renowned travel destinations for many reasons, beginning with Mykonos Town (or Hora in Greek). This small capital is one of those perfectly picturesque old towns in the Med where you just want to get lost for hours, finding new gems around every corner. It’s also home to some pretty epic backdrops for your family photos. These include the colourful balconies of ‘Little Venice’ that hide charming cafés and boutiques, and the iconic row of old windmills which remained active until the 1960s but have now been converted into shops, museums and hotels. Make sure to keep the kids on the lookout for Petros the Pelican, Mykonos friendliest avian resident and unofficial mascot of the town. The south side of Mykonos is brilliant if you’re after a five-star beach experience while staying protected from the island’s strong winds. Just keep in mind that you’ll want to keep on family-friendly beaches such as Aghios Ioannis and steer clear of the never-ending party of Paradise beach and the like. In general, it is the north side of the island which tends to be less crowded and more suited to families – ideal for enjoying the beautiful seaside and indulging in fresh local seafood. But a happy medium might also be Psaroú on the westside or Kalafátis and Kaló Livádi in the east, depending on where on the island you’re staying. 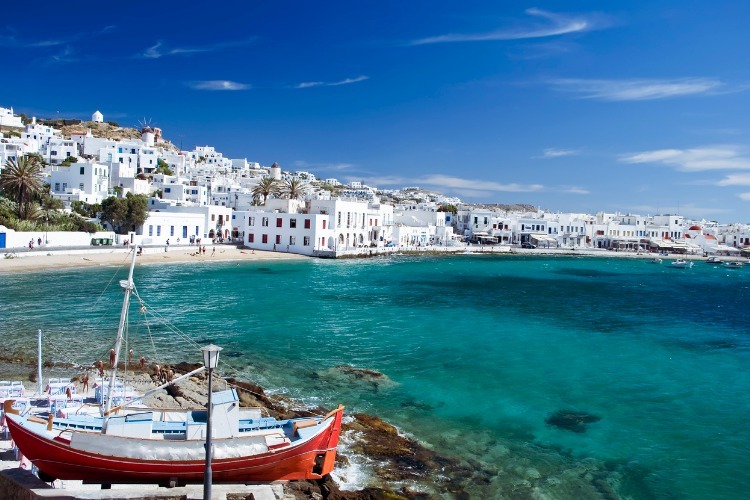 If your children are old enough to try their hand at scuba-diving, or if you’re looking for an all-adult activity, Mykonos is a great place to head deep underwater. 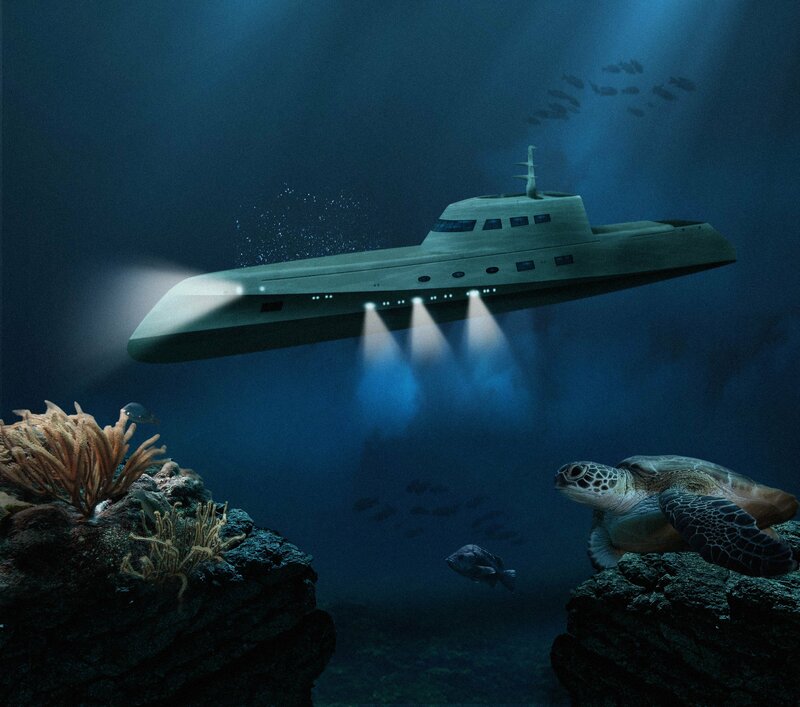 There are plenty of caverns, reefs and shipwrecks to explore, and good schools for beginners. If you prefer to stay above the surface, head to Korfos Bay and try your hand at kite surfing. In case you didn’t know, Santorini came to be by way of a volcano-eruption that sank the middle of the island and leaving only the rim. Thanks to this unique topography, the island is now home to some of the most well-known and celebrated sights in Greece. Whitewashed clifftop villages with magical views of the Aegean Sea-crater…. Isn’t that the stuff of what our Greek holiday dreams? Practically a volcanic playground, trendy Santorini is unexpectedly great for family holidays – particularly if you’ve got nature-loving kids who like swimming. Be prepared that the beaches here are made up of black volcanic sands, and while they’re really cool and have great swimming (Monolithos Beach is our favourite) the ground gets hot in the afternoon (and we mean hot), so keep beach-time a morning activity and spend the rest of your days exploring all the other wonders of Santorini. Caldera and Oia are two of the incredibly scenic villages that make Santorini the destination that it is. They’re very popular, and a must-visit on your Santorini bucket list but perhaps not the most family-friendly places to stay. Head for lower ground in Perissa or Kamari, where you’ll find more of a family-atmosphere and better access to the beach. Known as the ‘Greek Pompeii’, the ruins of the Minoan settlement Akrotiki are one of the many sights to explore on Santorini. After being buried in the ash of a volcano-eruption, the excavated village was found in near-perfect condition and is now open to the public to walk through. Another one of Santorini’s main draws is its famous volcano, and a holiday here wouldn’t be complete without seeing it up close on a boat tour. You can even walk all the way to the top and look out over the craters, and swim in the hot springs where the water is especially warm thanks to the volcanic activity. 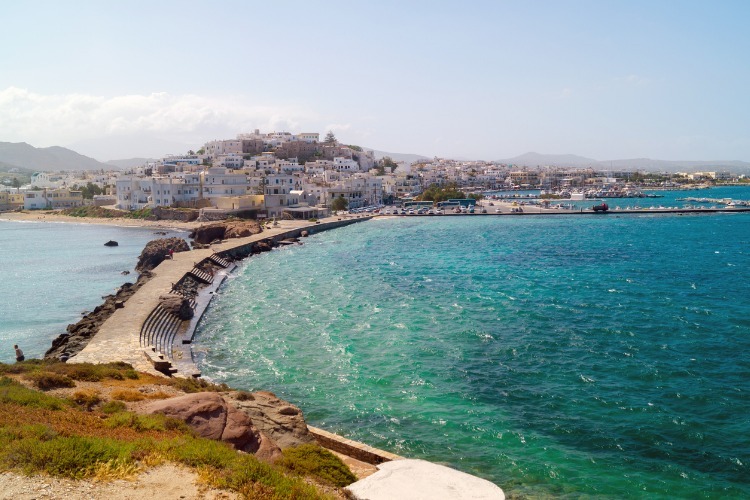 Naxos, the largest of the Cyclades Islands, is famous for its spectacular beaches – unique in that the coastline isn’t cluttered with all-inclusive resorts as you’ll find in most of Greece. Perhaps for this very reason, Brits don’t seem to have quite discovered the magic of Naxos yet. The rest of Europe, however, has appreciated it for years. With crystal clear waters that are completely safe for children to play and swim in, as well as soft golden sands, Agios Georgios, Agios Prokopios and Agia Anna are all great central options. They’re perfect for when you want to be close to the sights as well as the affordable shops and restaurants in town. For something a bit more adventurous, head to Plaka Beach for windsurfing lessons accompanied by the prettiest sunset on the island. Inland, you can hike 40km worth of trails that take you past the islands many ancient villages – each of which is well worth exploring but the former capital of Haldiki especially so. Take a tour of one or more of these stunning mountain villages where you’ll come across the heart of the local culture and fascinating historical monuments to match. Since Naxos is rare in that the island still produces most of its food locally, you know that no matter where you choose to dine, you’re going to get the really good stuff for yourself and your little ones. Rarely visited by foreign tourists, Milos remains authentically Greek and is a family favourite among the Greeks. It’s an up-and-coming destination, so we’d recommend visiting before the rest of Britain catches on. Milos is a volcanic island full of caves, caverns and beautiful rock formations waiting for your little explorers to discover. Swimming among these impressive cliffs is a real treat for kids with a sense of imagination, and if they’re feeling brave, they can even try some low-level cliff jumping. If you only choose to visit one, make it Kleftiko – a cluster of rocks with hidden caves that were used as a hiding place by pirates back in the day. And don’t forget your snorkelling gear! If you prefer lounging on the beaches, the kids will probably like Paliohori. It’s the most prominent and liveliest beach on the island, so there is always something going on. There are, however, over 70 beaches around the coast so no matter what you’re looking for you’re bound to find it – except for beach clubs and bars. 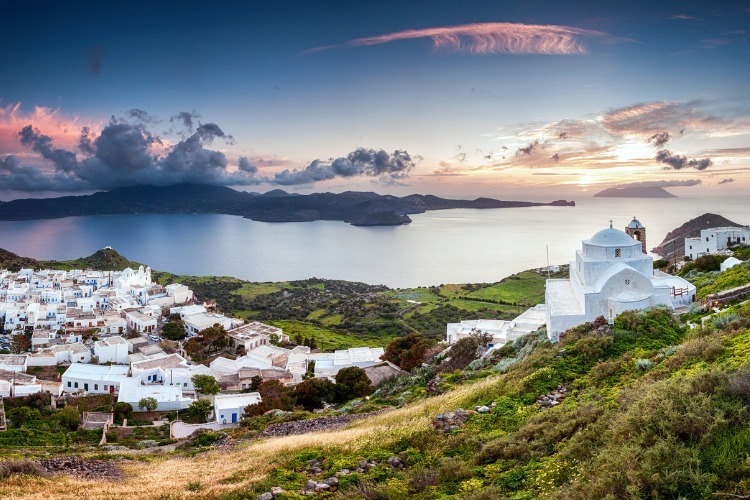 No Greek holiday would be complete without a hefty dose of culture, and Milos has plenty to offer. It is where the iconic statue, Venus of Milos, was found, although it now stands within the Louvre in Paris. On the island itself, you can discover the world’s third-largest catacombs in Plaka, a beautiful Roman amphitheatre and the gorgeous hillside towns of Trypiti and Klima, all along the same mile-long hiking trail. Paros is quintessentially Greek in all the ways that make us go on and on about island magic. Picturesque villages with blue-domed churches and lively harbours just stones thrown away from gorgeous sandy beaches. But Paros also lies less than two hours by smooth-sailing catamaran from both Santorini and Mykonos, and both are perfect for day trips during your holiday. Because why stay on just one Greek island when you can just as easily visit three? 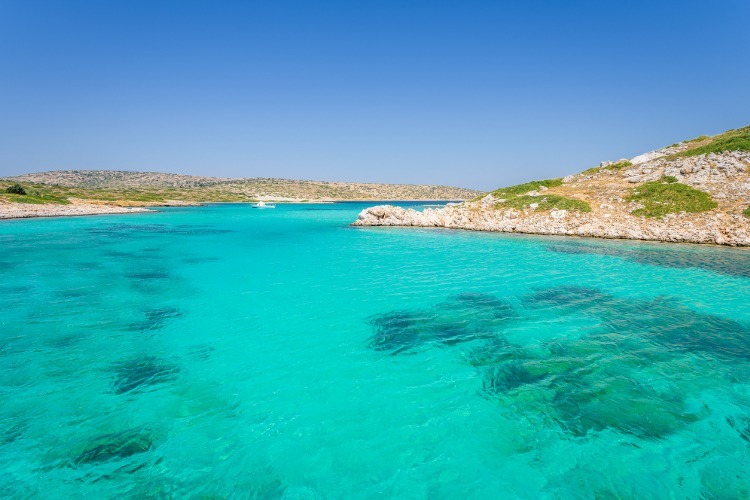 Another, even shorter, trip is the ten-minute ferry ride to Anti-Paros, where Tom Hanks has his private holiday residence, and the rest of us can marvel at the stalactites and stalagmites of the beautiful, deep caves. The chic fishing town of Naousa on the island’s north coast is one of the best places to stay when travelling with the family. It’s full of trendy seafood restaurants, small tavernas and a timeless vibe. 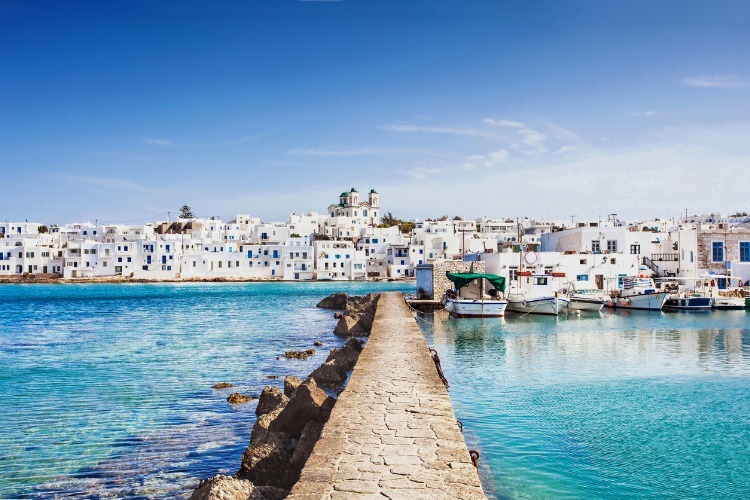 The capital of Paroikia is also well worth a visit, but it retains much of the party-vibe from earlier decades before Paros became the family-friendly paradise it is today. It’s reminiscent of Mykonos in many ways but has the benefit of being less crowded. Beaches abound on Paros as they do on all Greek islands. The largest is Chryssi Akti, nicknamed Golden Beach, but many of the smaller coves around the coast offer the same beautiful sand, sun and warm waters with fewer crowds. For a more unique beach experience, seek out Kolymbithres Beach, famous for its fascinating rock formations. And if your family is the active type, head out on the walking trails to see the 19th-century lighthouse on Cape Kórakas, try your hands at windsurfing at Khrysí Aktí, or wake up early and join a sunrise ride on the beach. Lefkada might not technically be an island, as it is connected to the mainland by a long and narrow causeway. 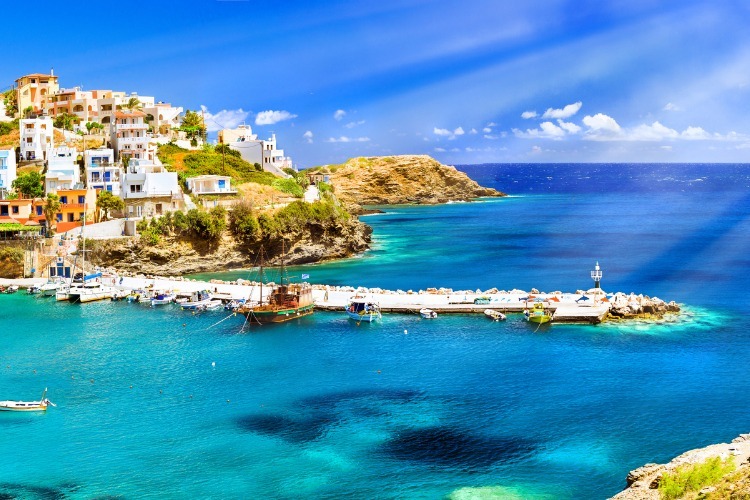 It certainly has that pure Greek island magic, however, so we have no qualms about including it on this list. While the lovely but small capital city can effortlessly be taken on by foot in less than half a day, it’s no less worth a visit for it. Located right on the seafront, wandering among its pretty buildings and popping in an out of cafés, boutiques, museums and churches before heading down to the marina for dinner is certainly not our idea of a wasted afternoon. In addition to its small-town charm, watersports adventures are one of Lefkadas biggest allures. It has a large marina and several big bays that are ideal for windsurfing, sea-kayaking, kitesurfing… you name it. If you want to try it, you can probably find it either in Vasiliki Bay or somewhere close by. On the island’s west side, you’ll find even more beaches which are perfect for lounging, sunbathing and picnicking, such as Porto Katsiki and Kathisma. 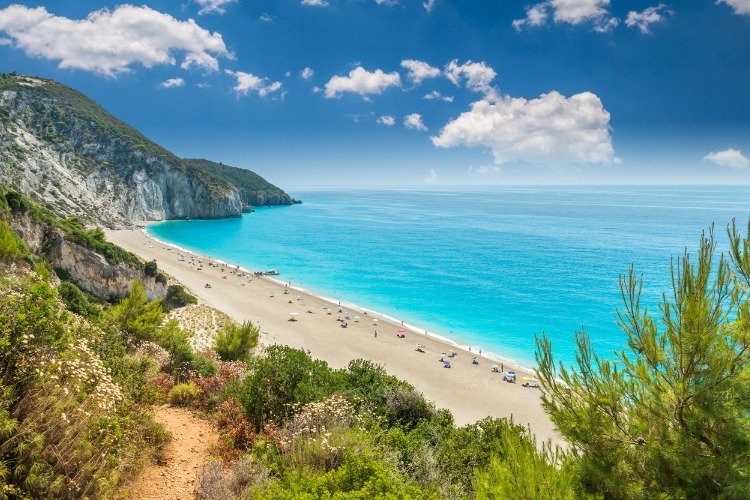 Backed by forested mountains, these golden beaches and their turquoise waters are the main appeal of those who are lucky enough to have discovered Lefkada (not many are, when compared to the likes of Mykonos and Santorini). On the island’s east side, you can take the family on a hike to the gorgeous Nidri Falls where water makes its dramatic descent from atop the mountains into a gorge of white rocks. And yes, swimming is allowed! Tiny little Paxos boasts a population of no more than 2300 locals. It’s small and uncommercialized, but perfectly escapist and surprisingly luxurious. Since it doesn’t have an airport, it remains off the beaten track. Paxos is a popular day-trip destination by boat from the larger islands in peak season, but you’re missing out if you don’t stick around a little longer. There are only three towns on the island of Paxos, Gaios, Lakka and Loggos, making it very easy to see it all. 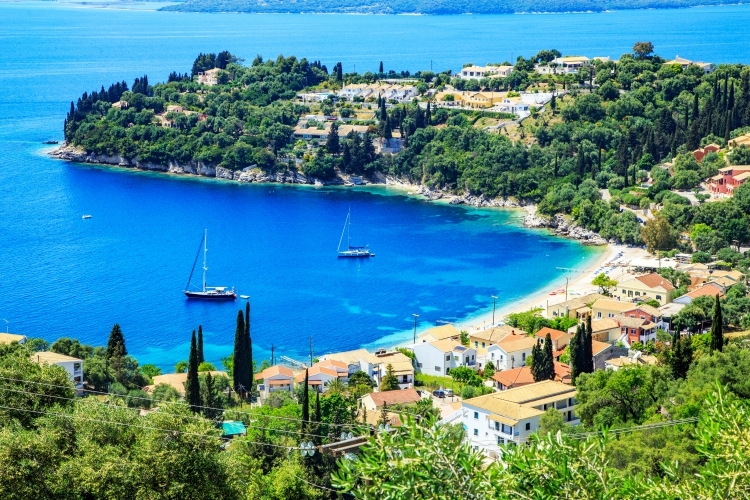 Lakka is a picture postcard town with a horseshoe-shaped bay full of little sailboats to watch come and go. All the roads here lead to the harbour, which is undoubtedly the centre of local life. Loggos is an equally charming harbour town with lovely family-owned tavernas by the water which is a treat when you want a slow, relaxed evening meal sound-tracked by ocean sounds. Gaios, the capital of Paxos, is hardly much larger than the other villages but alas the destination of most day trips to the island. It has a picturesque main square, plenty of shops where you can source local olive oil and wine, and great beaches nearby. There are convenient and well-marked trails that connect these seaside villages, and you’ll feel right at home in an instant. It’s also entirely possible to walk from one end of the island to the other, as it is only 16 kilometres long. Zakynthos, often nicknamed Zante, is another lesser known but perfectly idyllic island in Greece. Zakynthos’ Old Town is a wonderful village with rich Venetian history, beautiful architecture and plenty of pedestrian-only streets full of quaint shops and eateries. Get the best view of town by making an ascent to the Venetian Kastro, an impressive castle that stands among the greenery on Strani Hill. But don’t leave Zante without making a few visits to the island’s traditional little mountain villages as they are the stuff of old windmills and sunset views like you’ve never seen before. To the north of the island, you’ll find the beautiful lighthouse at Cape Skinari and just below it the marvel of Zante’s Blue Caves. Inside the caves, you can swim, snorkel and even scuba dive in the magical atmosphere of these natural rock formations – not one you’ll forget in a minute. The sandy beaches and calm waters of the islands east side makes it the best family-hangout. Tsivili is an excellent option if you’re looking for some water sports to perk up a lazy day. Many of the most beautiful coves are only accessible by boat so don’t be afraid to get out on the water and do a little exploring with your captain’s hat on. 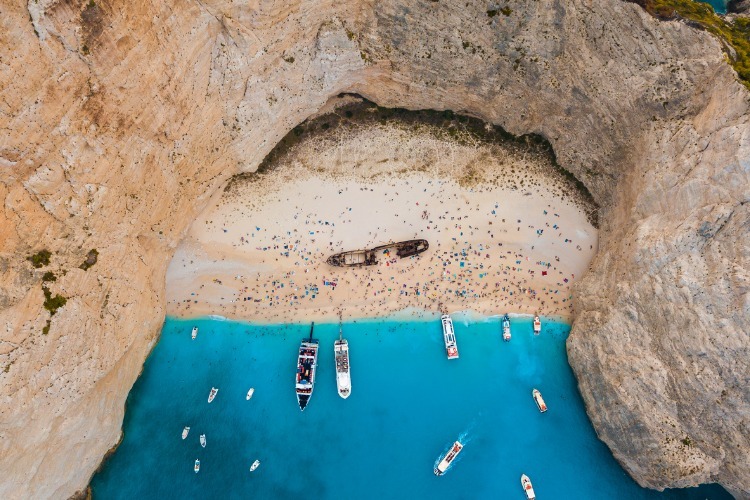 These hidden coves include the iconic ‘Navagio’ on Shipwreck Beach, sometimes called Smugglers Cove, to the northwest. The ship stranded on Zante in the early 80s and still sits prettily on the beach for kids of all ages to marvel at and making photographers go wild (it’s one of the most photographed spots in all of Greece). The beaches of Zante are famously home to whole populations of ‘Caretta-Caretta’, Loggerhead Turtles. Unfortunately, they have become endangered in later years but can still be spotted if you know where to look. Join a tour to Marathonisi, Turtle Island, and keep a lookout for dolphins in the water while you’re at it. Daphni Nesting Beach in Zakynthos Town is another great spot as it is a turtle conservation area. Just don’t forget your snorkelling gear! Kos is one of Greece’s most family-friendly islands. It has adapted to being popular with tourists and offers a real taste of local culture to its visitors. Among all the fascinating history of Kos, the Asklepion certainly stands out. The ruins of this ancient hospital originate from the time when the likes of Hippocrates still inhabited the island. Today you need a bit of imagination to picture its original glory, but kids tend to have plenty of that, and the whole family will love hearing about how this institution worked way back in the day. The Asklepion is just one of many ancient ruins scattered across the island, and you’re sure to stumble on quite a few. The beaches on Kos are enchanting and very varied. Thanks to the island’s volcanic nature, some have black-ish sands but many, especially on the south coast, are perfectly golden. Paradise Beach is probably the most popular, and for a good reason. The sea is warm and shallow, and there are lounges and umbrellas for hire that make it the perfect family day out. If you’re looking for something a little different, head to Agios Fokas. This pebble beach isn’t the main attraction, but a short walk from its shores you’ll come across the hot springs of Bros Therma. These are natural thermal springs that emerge from the crags thanks to the island’s volcanic past, a natural swimming pool if there ever was one. You’ll find plenty of picturesque stone windmills on most Greek islands. On Kos, however, you’ll find one of the few that are still active. The last working windmill of Kos stands in the village of Antimachia, and you can taste the lovely creations made from its flour in the shop on site. Another great adventure in nature for the little ones is a visit to Zia Natural Park. It’s a great way to appreciate the stunning natural landscape of Kos, and kids are welcome to feed the animals as you make your way along the paths. At the very top is a beautiful lookout point with views over the island and hammocks to rest tired little feet. And… exhale. That was a lot to take in, but hopefully, it got you dreaming about the magic of Greece. If you’re starting to feel ready for a holiday, take a look at our portfolio of extraordinary Greek holiday homes. We have properties on Crete, Mykonos, Santorini, Rhodes, Corfu, Kefalonia, Lefkas, Skopelos and Mainland Greece. If you need any help finding the perfect place for you, get in touch with our helpful concierge team!